Hotel 81 Geylang offers affordable accommodations, conveniently located a 10-minute walk from Aljunied MRT Subway Station. It has a 24-hour front desk and provides tour booking assistance. Free internet is available. Hotel 81 is in the vibrant Geylang district, surrounded by numerous local dining options. It is a 15-minute drive from the central business district and approximately a 25-minute drive from Changi International Airport. Rooms at Hotel 81 offer air conditioning and private bathrooms with toiletries. 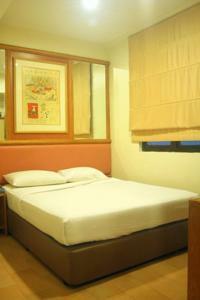 Cable TV channels and in-room tea/coffee making facilities are provided. Rooms: Hotel Rooms: 85, Hotel Chain: Hotel 81. Free! All children under 8 years stay free of charge when using existing beds. There is extra beds/baby beds in a room is 0 capacity for extra beds/cots in the room.